It's time to ask R U OK? THE yellow on the beach wasn't from the sunrise this morning, it was the community coming together to support one another and ask, R U OK? 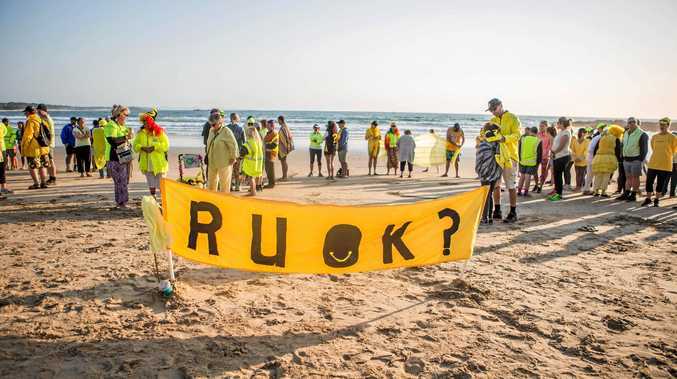 Locals and visitors wore yellow and met at Woolgoolga Main Beach for R U OK Day today, a national day of action, dedicated to reminding everyone that any day is the day to ask the simple question and support those struggling with life. The crowd formed a giant R U OK? on the beach before heading down to the Buster for Lifeline's Out of the Shadows Suicide prevention walk. Other activities are taking place at the entrance to the beach until around noon today including a breakfast barbecue by Key Employment, a fresh fruit tent run by Woolworths and a range of wellness activities such as yoga and Zumba. Head on down to start your Thursday off on the right foot.